I am not exactly a hot sauce connoisseur, but I enjoy spicy dishes – something I got from enjoying the dishes created in the Brazilian state of Bahia, a true melting pot where African and Luso-Brazilian cultures come together – something that is especially evidenced in their unique culinary tradition. So when I heard about http://nychotsauceexpo.com/the New York Hot Sauce expo in Brooklyn on the weekend of April 25, I immediately set to learn more about it and of course make some time to check it out. I tried to get Renata and a few friends to go as well, but since no one seemed interested I wound up going solo. It was not easy to get there – the event was at the Brooklyn Expo, a large event center in Greenpoint. I was unaware of subway changes for that weekend, so it took me much longer to reach the venue. As I entered, a chicken wing eating competition was going on but I didn’t pay much attention – I had just over an hour try some sauces. 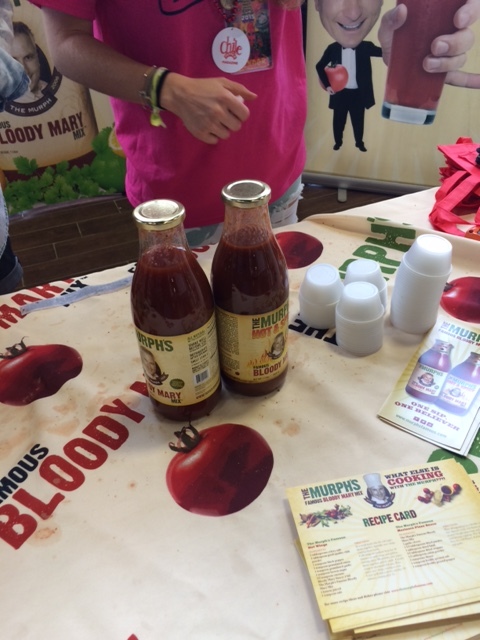 The first thing I tried was http://murphsfamous.com/Murph’s “Famous” bloody Mary mix, which had a harder kick than the average supermarket-bought competitor. I later headed to the bar and purchased an actual drink made with the stuff, and I must confess it was quite the experience – the vodka (Stoli, I believe) really brought out the flavors and intensity of the pepper. 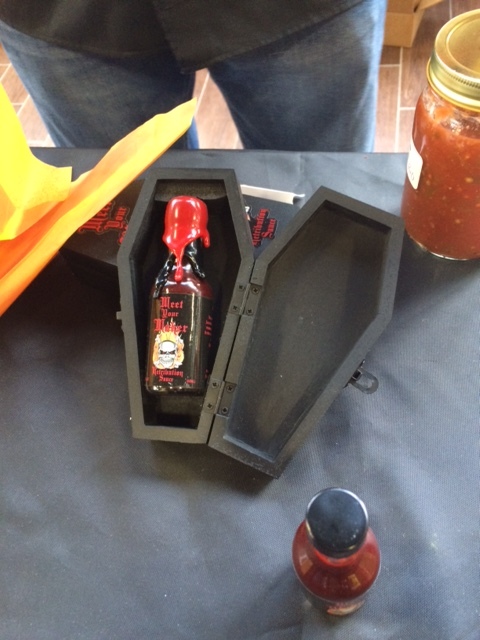 There was also a sauce that was called “Meet Your Maker Retribution Sauce” that promised to be the hottest in the show, clocking at a cool 6 million Scoville units (just to illustrate, jalapeno peppers have about 8,000). 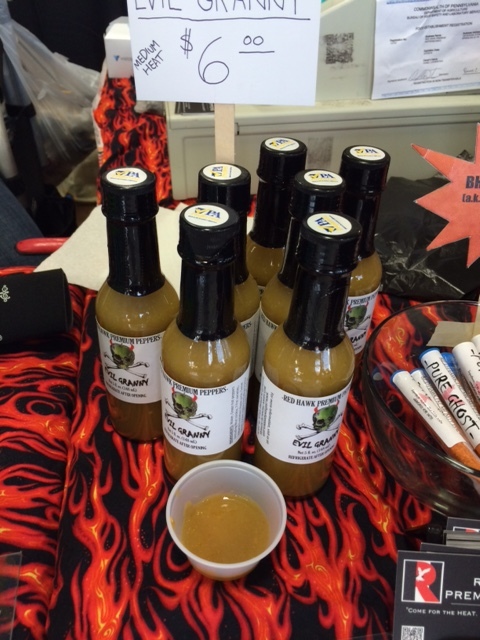 I stayed away from that one, and headed to other tables, where I tried some mixed by Tahiti Joe’s, http://tahitijoeshotsauces.com/a brand with tropical-based flavors. My favorite was “Mangonesian,” a mango-based concoction made mostly with chipotle peppers. It had a nice sweet feel and a burn that came a bit later. Another type I liked was a jalapeno and granny smith apple mix called “Evil Granny,” which was a bit milder than I expected but that added great flavor to the food (I made a breakfast omelet with it the next morning with great results). Finally, there was a spicy dipping sauce made with pineapples that I also brought back home and served with tortilla chips to a Brazilian couple that came to hear me play Sunday mass – the impression was unanimous – mixing sweet and hot was a pretty cool idea, and it paired well with the cold beers we were all sharing.